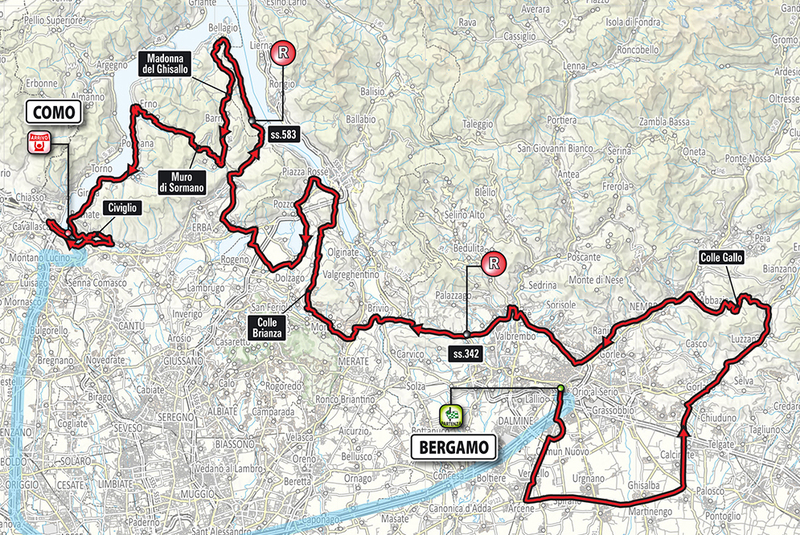 The race starts in Bergamo and it moves to the south crossing the Bergamo’s plain in order to climb the Val Cavallina reaching Casazza where the route faces the first climb Colle Gallo (763m). 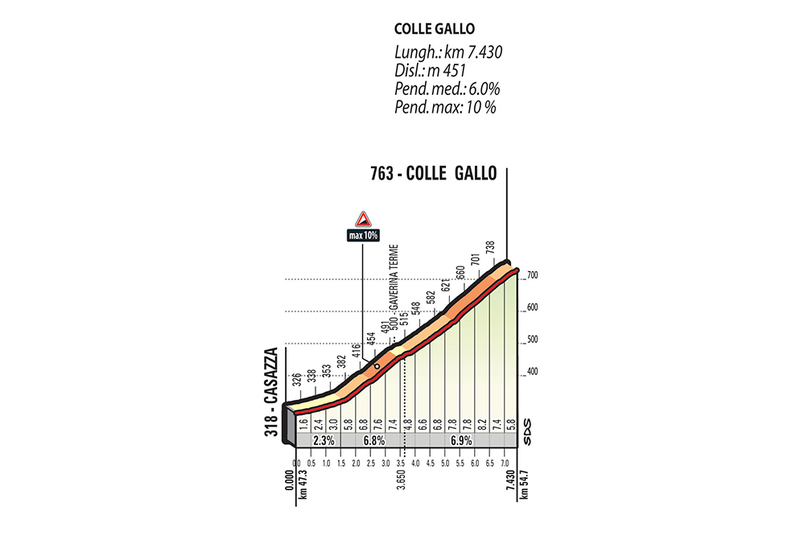 Colle Gallo is followed by a fast slope which brings the athletes in the Val Seriana close to Bergamo. 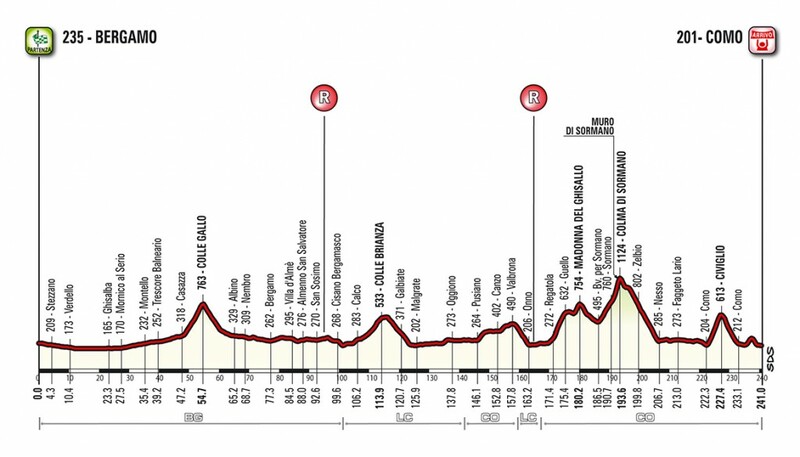 Here, the route becomes again flat and it leads in Brianza. Then, there is a short passage through Colle Brianza (533m) and it is followed by a slope leading to Pescate and Valmadrera. 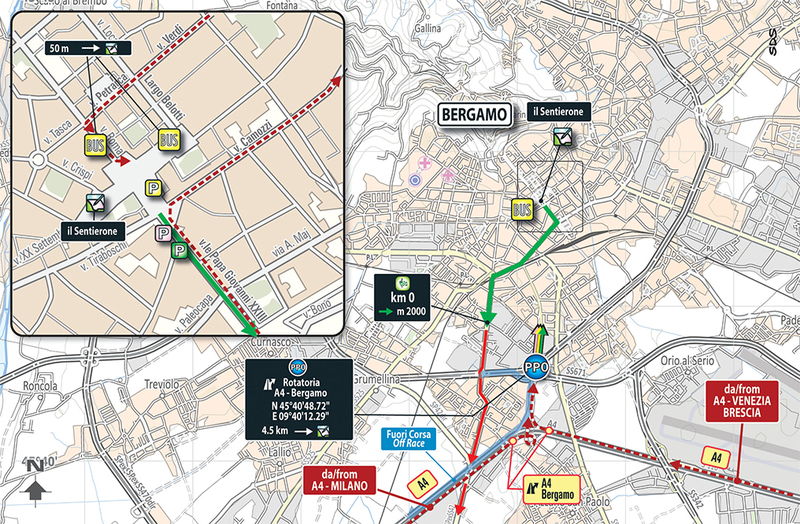 Moreover, the route moves to Oggiono crossing Pusiano and Assio. 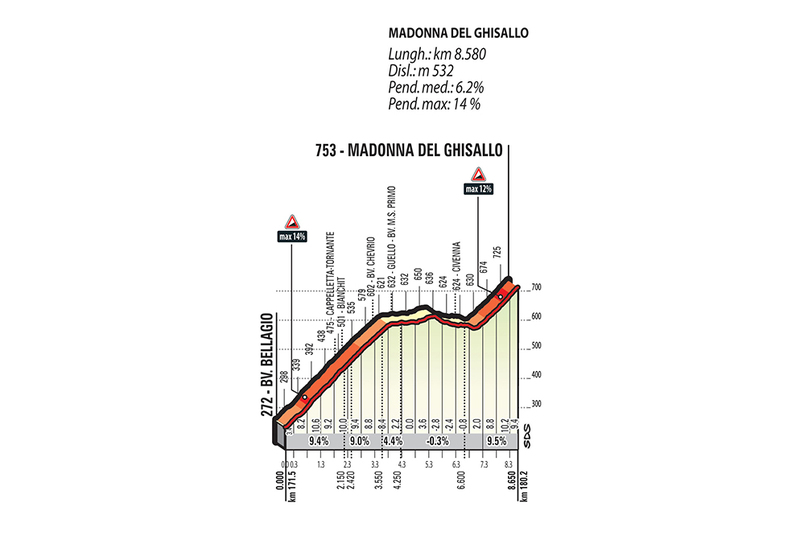 Then, a slope in Onno will lead to Bellagio where the Ghisallo (533m) climb begins. 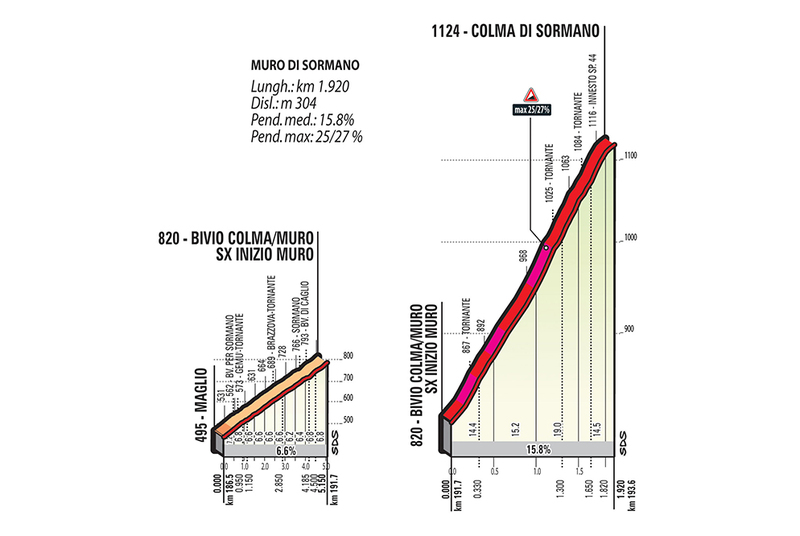 The climb with a gradient of 14% presents a wide road and series of hairpin turns. 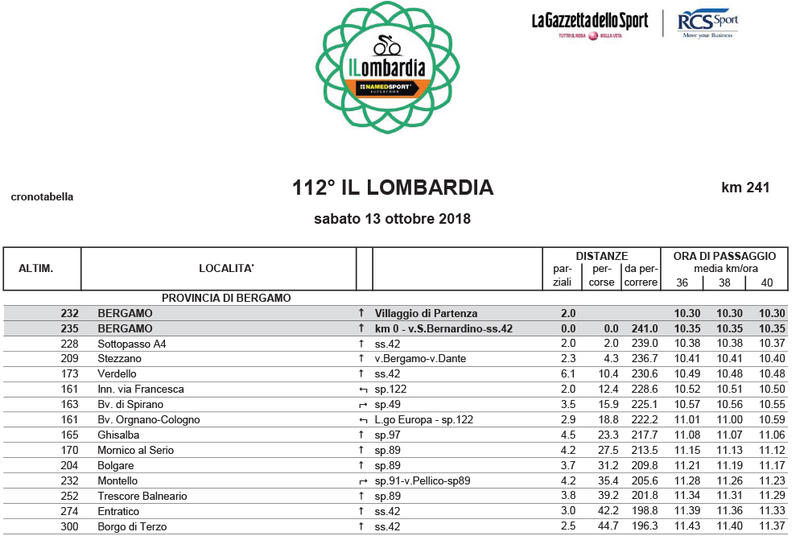 The next slope is very fast and it implies a long straight road and it ends in Maglio where immediately starts the climb of the Colma di Sormano (1124m).There are few kilometers of middle incline and few hundred meters later starts the Muro of Sormano (2km with 15% incline) presenting a narrow and very steep road. In this part the race crosses a thicket with narrow hairpin turns and the road reaches gradients of 25% and 30%. Passed the Colma there is a slope (at the beginning it is a slight slope, then it is demanding with hairpin turns and narrow road) at Nesso where the race takes the coastal road to reach Como. 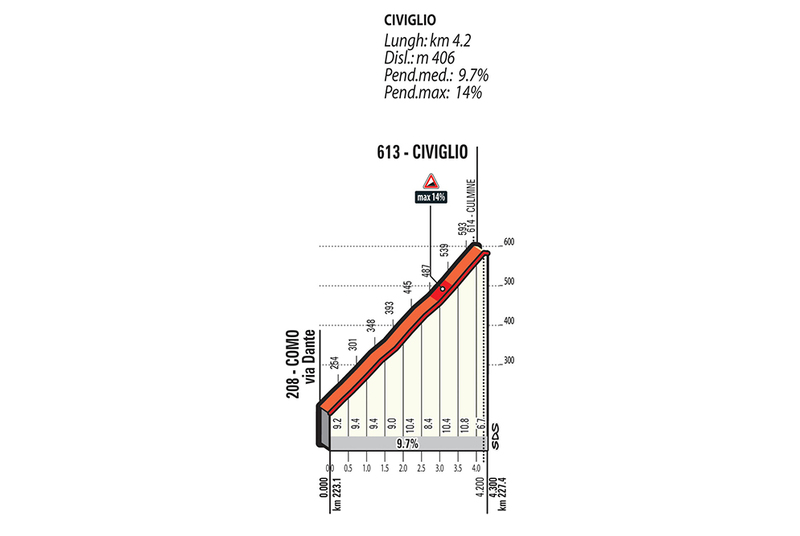 Then, the route implies the hard climb of the Civiglio (614m) with around 10% of gradient (notice that there is significant narrowing of the road on the top of the climb). 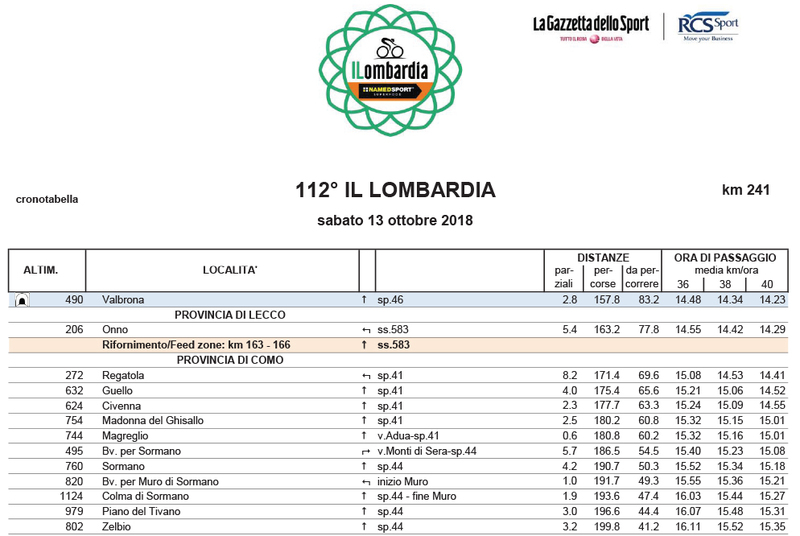 Moreover, the race will descend and cross Como to take the last short climb at the bottom of San Fermo della Battaglia. 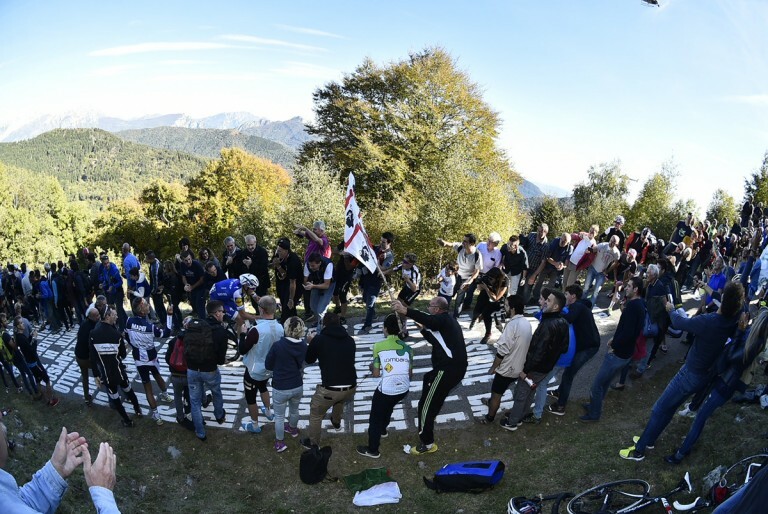 There are two fixed feed zones: the first one in San Sosimo (km 92 – 95) and the second one in Onno (km 163 – 166). 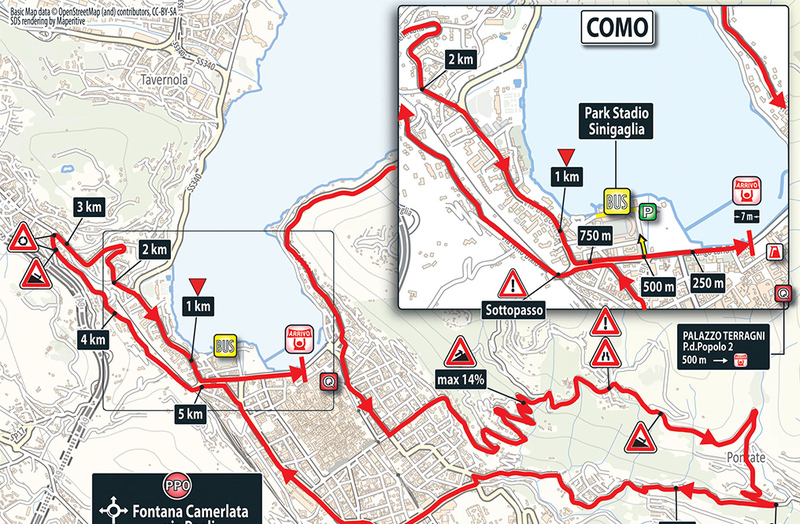 The last 10 kilometers starting inside the residential area of Como present large roads until the underpass where it begins the 1500m final short ramp of 5% incline. 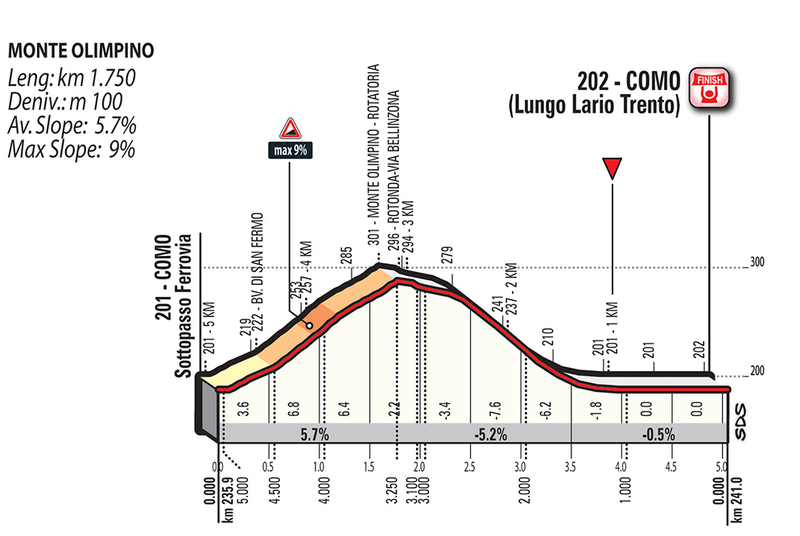 Reached the roundabout in Largo Ceresio it begins the last 3 km and the slope bringing to Lungo Lario. The slope presents a wide road well paved and meets two well illuminated tunnels and two roundabouts. It ends at the last km. At 600m from the arrival there is the last wide turn on the left. The arrival is on asphalt and the width of the road is around 7m. The city of the “Thousand”, hence named after the many volunteer soldiers that committed to the cause of Italian Unification, led by Garibaldi, is divided into Bergamo Alta (the upper town), namely the historical district, and Bergamo Bassa (the lower town). The upper town (Città Alta) is one of the few towns in Italy whose centre is still entirely surrounded by walls. Piazza Vecchia is the heart of the city; main sights include the Contarini fountain, Palazzo della Ragione and the civic tower (Torre Civica). Major landmarks also include the Colleoni Chapel, one of the many monuments in Bergamo dedicated to Bartolomeo Colleoni, a famous warlord who was born in Solza, on the bank of the Adda River. By the end of his career, he had become captain-general of the Army of Venice. This was a land of warlords and a land of Popes too, with John XXIII, known as “the Good Pope”, who was born in Sotto il Monte, nearby. A number of characters of Italian Comedy are “native” to this area, too, the most famous of which being Arlecchino (Harlequin) and Gioppino. Bergamo was hometown to many football stars (both the former coach of the Italian national team Donadoni and Giacinto Facchetti were born here) and cycling champions such as Felice Gimondi – Tour de France, Giro d’Italia and Vuelta a España winner – and Paolo Savoldelli, an unstoppable downhill racer, dubbed the “hawk from Bergamo” (who was born in Clusone, nearby). 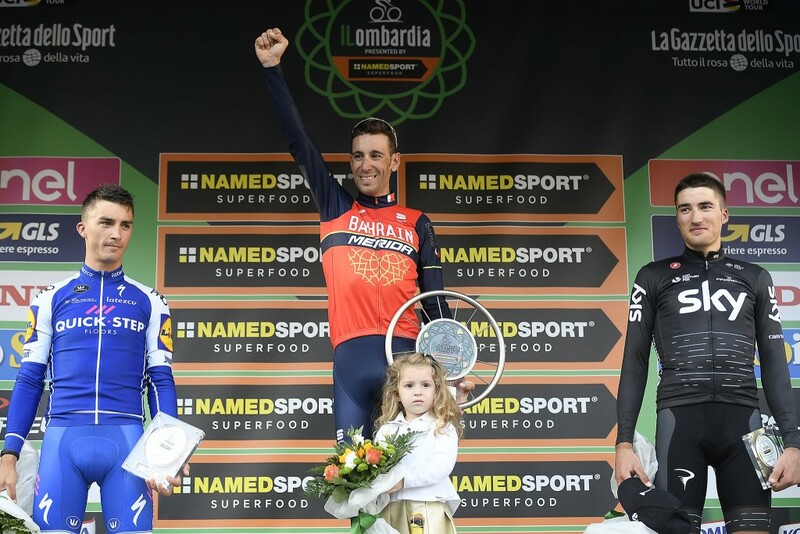 Ivan Gotti and Beppe “Turbo” Guerini, both of whom scored major achievements in top races, were native to the area, too. 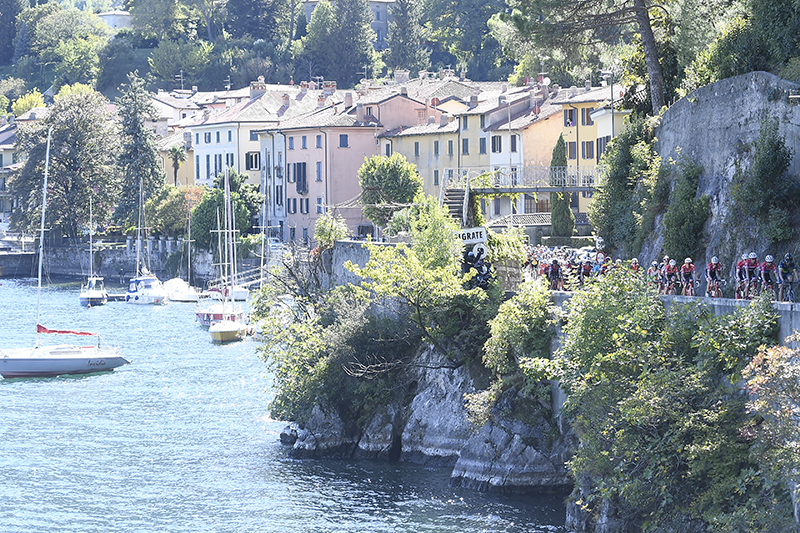 Celebrated by Manzoni, Byron and Stendhal, Lake Como is considered as one of the most beautiful lakes in the world. Nowadays a major tourist destination, also for Hollywood celebrities such as George Clooney, the city and its surroundings are a major pole in the Italian silk manufacturing chain. Historically, it was the third city in Italy receiving a medal of honour for its contribution to Italian Unification, with reference to the battle of San Fermo in which Garibaldi led the Hunter of the Alps (Cacciatori delle Alpi) corps to defeat the Austrian forces, thus defending the city of Como. The city centre overlooks the lake of the same name. Rising in the historical district is the Cathedral of Santa Maria Assunta, the city’s Duomo, one of the major cathedrals in Italy. Its dome was designed by Sicilian architect Filippo Juvarra. Every day, a cannon shot is fired at 12:00, marking noon for all the citizens. The shot can be heard throughout the city centre and the urban area. Main events include the traditional Sant’Abbondio festival, dedicated to the patron saint and celebrated every year on August 31, as well as the evocative Sagra di San Giovanni Battista. The latter is a historical re-enactment of the Mediaeval wars that were fought on Lake Como, which features a magnificent fireworks display and a lake cruise that sets sail in Como and takes passengers on a journey with live music and dancing. 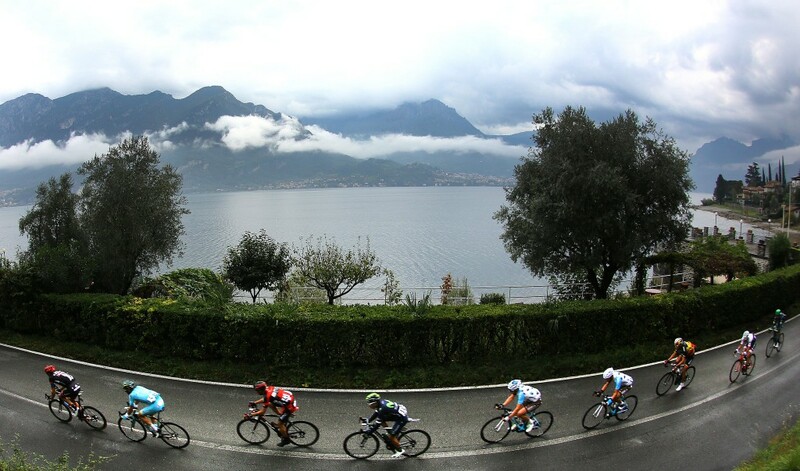 Como has hosted six Giro d’Italia stage finishes, and it was finish city for the “Il Lombardia presented by NAMEDSPORT” classic several times. This year, conversely, the “classic of the falling leaves” will be starting here, as it has only done twice before.